Updated Monday February 26, 2018 by Kanata Baseball Association. Registration is open NOW for ALL indoor Programs! We expect programs to fill up fast so register early to have the most selection of available timslots and program offerings. Instructors are Greg MacDonald, Jesse Gratton, and Roch Seguin. * H12 (#3066) was folded into the H10 and H11 which caused some players to change times. Head instructor is Tyler Roth along with athletic trainers and assistant coaches. Head Instructor is Ryan Hobbins with Troy Forgie. Play your own way. Develop your skills with other girls and grow the game. All ages welcome in 3 separate age groups. The program consists of 4 sessions, every other Saturday in Feb and March. Specifically the program runs on the following dates: Feb 10th, Feb 24th, Mar 10th, Mar 24th. Instructors are Hannah Martensen and Jenna Flanagan. This is our general baseball skills program. 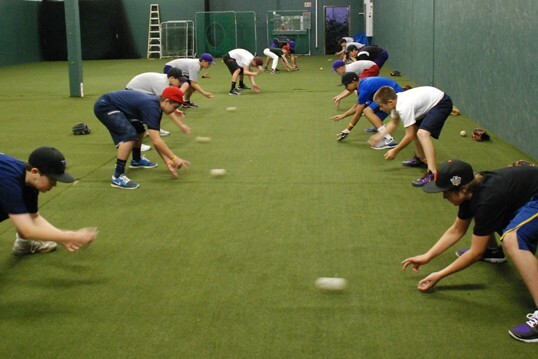 Players will focus on the fundamentals of the sport including throwing, catching, fielding and hitting. These sessions are available for players of all ability levels. This is a great way to get a head start on the baseball season so your player is ready to hit the field when the sun comes out. The older ages (W1, W2) are held at the Sensplex on Fridays $125. Younger players (W3) are at the Cubhouse on Sundays $70. "For girls baseball, where do the 9yo girls fit? " "How do I get to the registration page"
"9 Yr old girls are in the Second session (typo fixed, thanks!)" "To reach the registration page, there is a red "Training Programs" button on the left of the main page, or use this link: https://registration.leaguetoolbox.com/site/Cart/init/league-986"
"Will there be any additional pitching sessions for 11-12 year olds added this year? " "We are at capacity for all programs now which run through the end of March. After Easter the focus will be on the Little League, Senior League, Rookie and Rally Cap evaluations which will lead into some Spring Training sessions for those teams. The OBA teams continue their indoor practice schedule through to the end of April. "